Robinson and the Ack Attack go down hard! 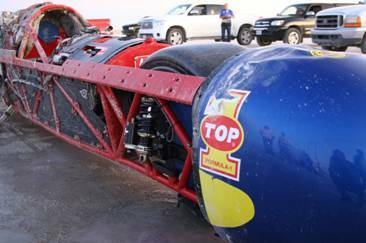 The Top 1 Ack Attack took a huge tumble late in the first day of competition at Mike Cook’s Landspeed Shootout. The team took to the salt shortly after the meet was called to a close ending the first day of competition. The goal was to do a couple of low speed “calibration runs” to synchronize the wheel sensors with the new traction control system. This would be the first time this system would be utilized on the current world’s fastest motorcycle in hopes of getting better hookup at the rear wheel. Because the meet was already over for the evening, the ambulance had already left and course workers had begun cleanup and grooming of the course for the following day. 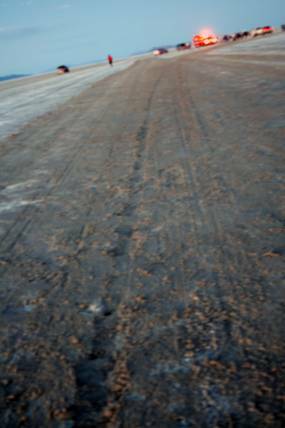 We trailered the bike to the 3 Mile mark and unloaded on hard, smooth salt. At this point the bodywork had been left off for easier access to the TC unit which would possibly need adjusting during the test. It should also be noted that there was no parachute installed in the bike, which in hindsight was a bad idea, but at the speeds we anticipated running, it was decided it probably wasn’t necessary. We pushed off and I ran the machine up to around 100 mph, pulled in the clutch and free-wheeled for over a mile collecting data for our new system. I dropped the landing gear, eased on the rear brake and brought her to a stop without incident. At this point I thought the testing was over. Mike and the crew then trailered the bike down to the pit end where the salt was really wet with holes and a loose crust. They unloaded right in the middle of it. As a driver I wasn’t too thrilled with the idea, but what I learned was Mike wanted me to break the rear tire loose (or see if I could which would override the traction control) and he figured in the loose salt it would be the easiest place to do so. Against my better judgment I climbed aboard while my crew strapped me in. On our first push off I was unable to get the twin transmissions into gear. We stopped, regrouped and connected the push vehicle a second time. To give you an idea how wet and soft the ground was, the weight of the bike created a hole that we literally had to roll the bike out of before we could take off. About a ¼ mile ahead of us was a channel where water had run across the track and cutting a trough along the way. This was filled in with loose salt which concerned me because I knew I would have to have the gear up before I hit this otherwise it could catch and put the 21 foot streamliner on its side. 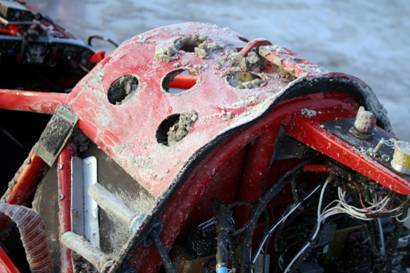 After both engines were lit, the push vehicle put us in motion, squirming our way down the wet salt. Mike read off the speeds to me, “20, 30, 40 mph. Go Rocky,” he said. Usually we push up to 50 but with the channel of loose soil approaching quick, there was no time, I had to get the gear up and out of the way. As soon as the gear was up I noticed the bike felt kind of squirrelly. It tipped from one side to the other slipping in the wet salt. I rolled the throttle on gingerly and managed to get it straight up just before the loose channel of salt crossing the course came along. I made it through it with no drama then started rolling hard into the throttle. I kept watching the red light which shows wheel slip. Again, the goal being to make it slip and override the traction control. I was picking up speed but the motors felt like they were laying down, kind of like the gearing was too tall, but what it really was was the traction control only allowing minimal throttle keeping the tire from spinning in the loose salt. I continued rolling into it. I must have been ¾ throttle, which under normal circumstances would have the engines revving and the turbo spooling up starting to make horsepower. The course was bumpy and wet, and difficult for a 1000 horsepower 21 foot long motorcycle to accelerate on. I hit a patch of decent salt with a little grip and that was all she wrote. Like a light switch, the full magnitude of the twin engine powerplant hit all at once. The engines revved hard, the tire spun and started coming around on the left. I was crossed up like a flat tracker exiting the turn on the mile. The bike was leaning right and for a moment I thought I might low side. I steered right and was actually able to save it and pick the long streamliner back upright. The rear tire was spinning so fast by this point that after it righted itself the rear shot to the right, snapping like a whip, this time low siding to the left at a 90 degree angle to the direction of travel. 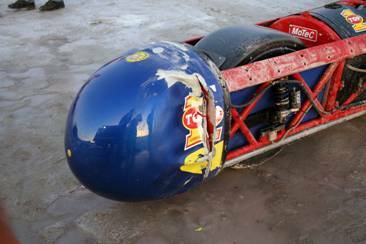 Remember there is no bodywork on the bike and this time the frame caught the ground, digging into the salt and catapulting the Ack Attack into the air. 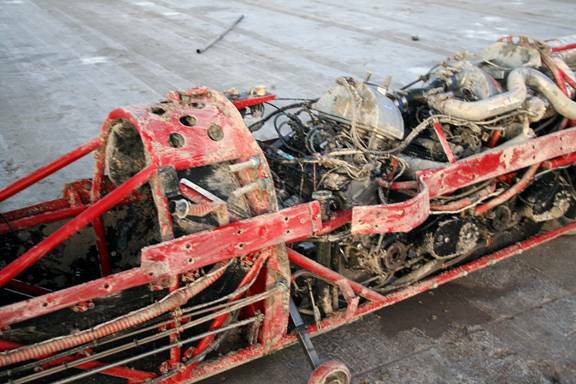 The bike was spinning clockwise through the air and hit hard, directly on the roll cage and nose of the bike, crushing the aluminum nose tank and sprayin g hot water everywhere. The impact was so great that I had a death grip on the handlebars; even though I had arm restraints on I was determined not to let go and trust them or anything else. This is why I trained so hard in the off season, so I could react and so I could protect myself and also so as to minimize injury should it be unavoidable. I felt my neck and back compress against me, even though I tightened my torso and fought to keep from collapsing fully. Without the bodywork the bike caught and lifted again, spinning in the air, coming down on its lid a second time, this time the tail hitting hard, smashing the exhaust cone in the process. The bike continued to catch, lift and roll repeatedly. Part of an upper frame rail ripped free from the bike, snagging into the salt and digging a deep gouge filled in red from the powder coated frame rail. One of the water pipes that runs the length of the bike from the nose tank to the engines ripped free, as did smaller mounts and sheet metal pieces which tore free on impact. The cell phone that we use for a radio receiver flung into the air and landed 30 feet away from the machine once it finally came to rest. It all happened in seconds, yet I still see it in slow motion every time I close my eyes. I immediately undid my harness and released my arm and leg restraints. A pool of liquid was quickly flowing all around me and I wanted nothing more than to get the hell out. I yelled at the first person I saw, who grabbed my arm and helped pull me from the liner which was now lying in a heap on its side. My thinking was that I would rather be lying broken on the salt than get caught burning inside the streamliner should I wait too long to decide. As it turned out, most of the pooling liquid was the coolant from the nose, but I was glad to be out just the same. I got to my feet and staggered away from the bike. My crew grabbed me and sat me down on the fender of our trailer which had just pulled up. I was hurt and possibly in shock. I felt dizzy and started feeling nauseous. Someone handed me a phone and told me I’d better call my wife, who was already back at the hotel since the meet was officially over for the day. I could hear the panic in her voice when I told her she needed to come out here and that I’d been in a bit of an accident. It was then that I became really dizzy and thought I might faint of pass out. They laid me on the salt and cut my race suit and t-shirt off to have a closer look. Next thing I remember I’m in an ambulance strapped to a backboard with a neck brace on and my head taped to the board. 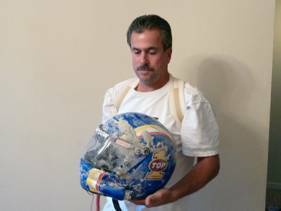 It was a long, miserable ride to the hospital in Salt Lake City , but I was happy that I was still around to feel the pain and as Burt Munro would say, “I lived to tell the tale,” I could live with that. Click here to see The Ack Attack Promo for 2010! Click here to see The Record Run for 2010! Own a piece of history! 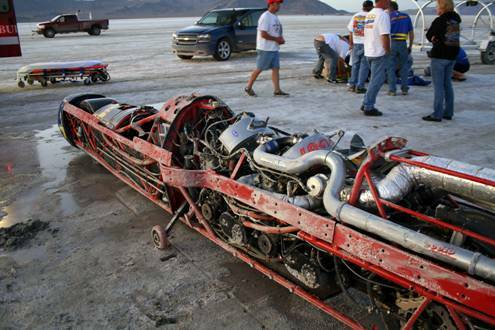 Ack Attack 376.363 MPH Land Speed Record shirts are now available. *Prices don’t include shipping which I will ship cheapest way. (plus freight) Email with sizes and address and I will ship and email price including shipping. 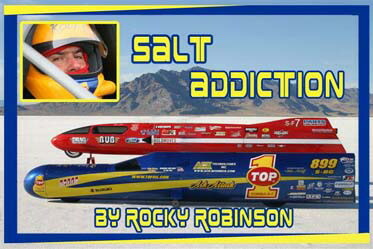 Check out Rocky's monthly column at MotorcycleUSA.com. Click on the links below to view past and current articles.